Picture this: A memory of a friend you haven’t seen in a while pops into your head. You smile at your fond recollection and suddenly have the urge to send her little something to show that you care. The only problem is, you’re not quite sure what to give. A text message won’t cut it, but a big gift seems doesn’t seem right either because there’s no special occasion. Wouldn’t it be wonderful if there was a shop that helped you send charming little gifts to your girlfriends just because? Turns out, there is! 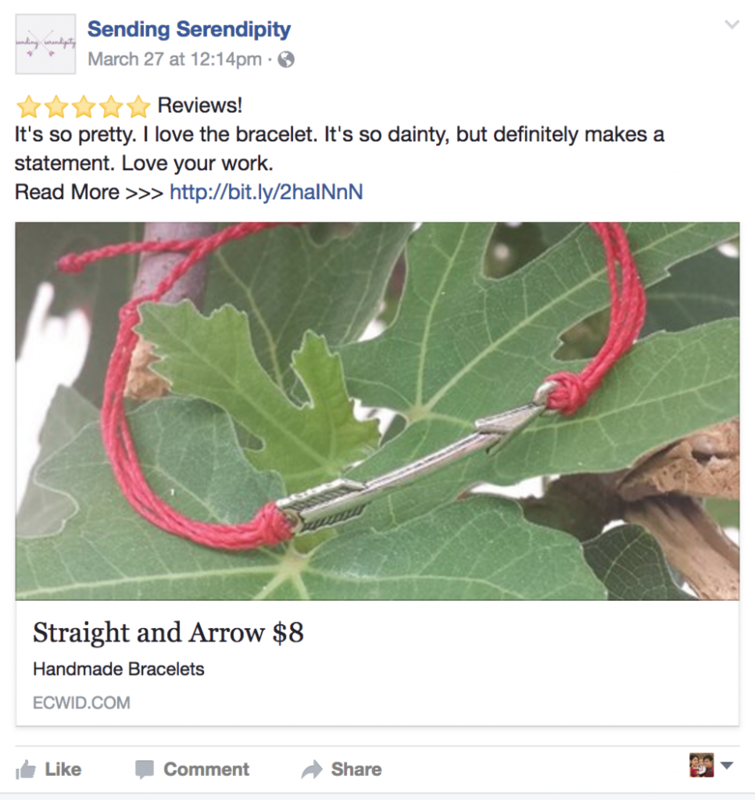 Introducing Sending Serendipity, a shop that specializes in hand-crafted bracelets for your friends. 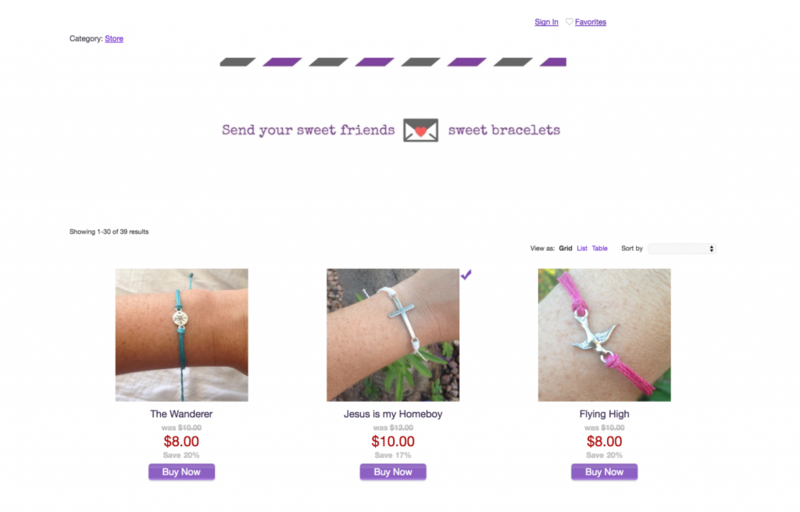 Founded by Traci Howarton-Garcia, Sending Serendipity is the perfect store for anyone who wants to send charming little bracelets quickly and easily. Traci makes everything by hand in her kitchen in Tempe Arizona, and each purchase helps support her family and loved ones. Want to learn more about Traci’s story? Read on. 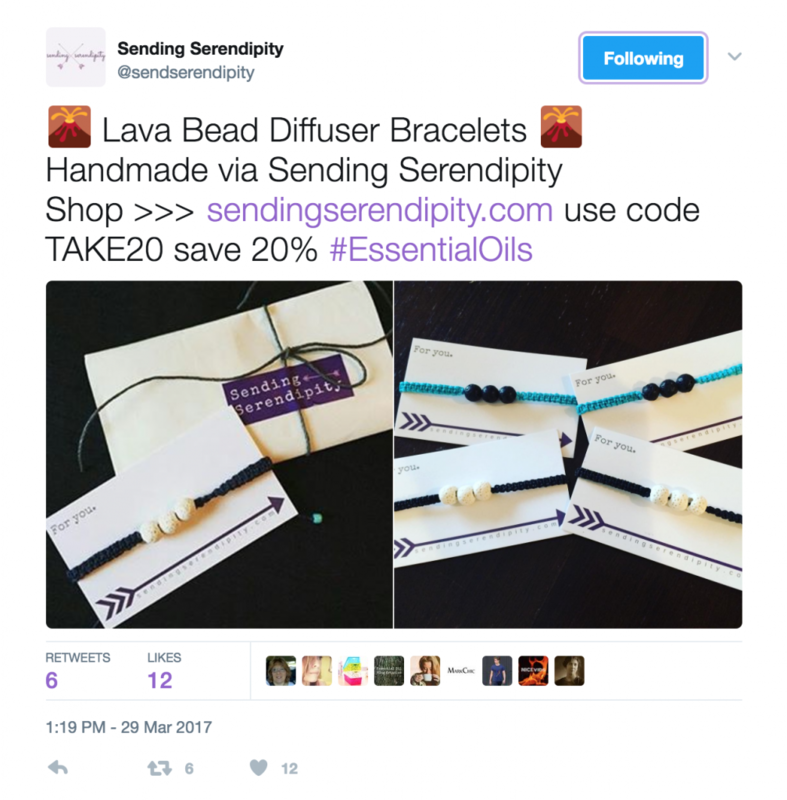 In this post, we shed light on the steps Traci took to establish Sending Serendipity, and you’ll learn how she went from making bracelets for fun to earning thousands of dollars (and fans!) selling her creations online. Check it out! Like many great things, Sending Serendipity was born from friendship. I had a really close friend in high school and she ended up going away to college. We never sent each other Christmas presents or birthday gifts, but every once in awhile, we would send each other little trinkets, like bracelets, shared Traci. According to Traci, she and her husband Mateo have always thought about starting a business but they didn’t know what they would sell. Marketing Traci’s bracelets didn’t occur to them until more and more people started to notice her creations. I was just making bracelets for me because I didn’t want to spend lots of money buying them elsewhere. Then some of my co-workers saw them and loved the designs so I started giving them away. That was when Mateo suggested they start selling the bracelets. To get started, they searched Google for an easy platform to create an online store. That’s when they found Ecwid, and it appealed to them immediately because of its ease of use and simplicity. I saw Ecwid and I said to myself, this is perfect. Ecwid was definitely the best looking and easiest to set up for what we were going for, she added. Traci didn’t have a website, so she used Ecwid’s Starter Site to get up and running. She quickly created a beautiful online store, despite the fact that she didn’t have a domain or any coding experience. It wasn’t difficult at all. We didn’t have to build anything — we just added some text and pictures. 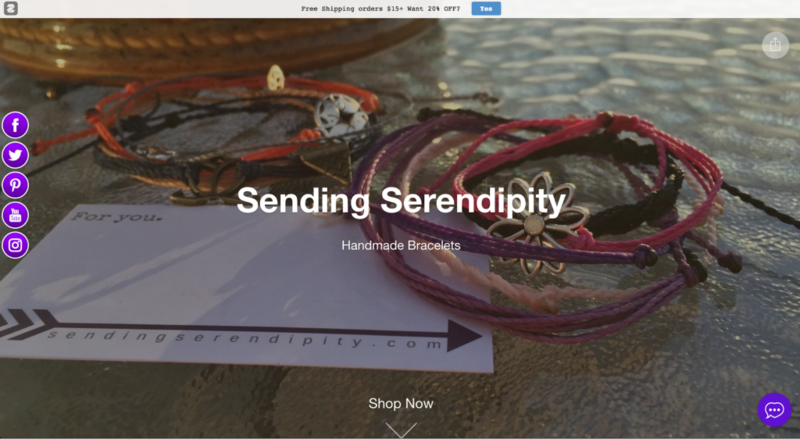 Sending Serendipity’s store doesn’t just look amazing, it also offers a great user experience. Traci has integrated a number of apps to expand the features in her store. For example, the Recently Viewed Products integration helps shoppers browsing the site easily access items they’ve looked at in case they need more information or want to quickly add the products to their cart. Traci also uses Chatra, an app that lets her offer live chat so she can instantly answer questions from her shoppers. When it’s time to checkout, Traci uses WePay to accept credit card payments from her customers. The seamless payment flow keeps customers on her site while payments are processing, and the low fees are great for keeping business costs low. These features make Sending Serendipity’s website a joy to use and no doubt they help make a great impression with customers. Armed with an attractive and full-featured online store, the couple started looking for opportunities to generate revenue. Traci is skilled at design and thinking creatively while Mateo is a highly adept social media manager. Together, they used their respective skillsets to market and grow the family business. Next, we’ll take a look at some of the most effective steps they took to generate traffic and sales. Mailing free bracelets helped Sending Serendipity get the word out about their merchandise. We send out a few bracelets a week. We give them away to people we know or sometimes to individuals on Instagram who we think would appreciate them. Then these people would post pictures of their bracelets then tag us. 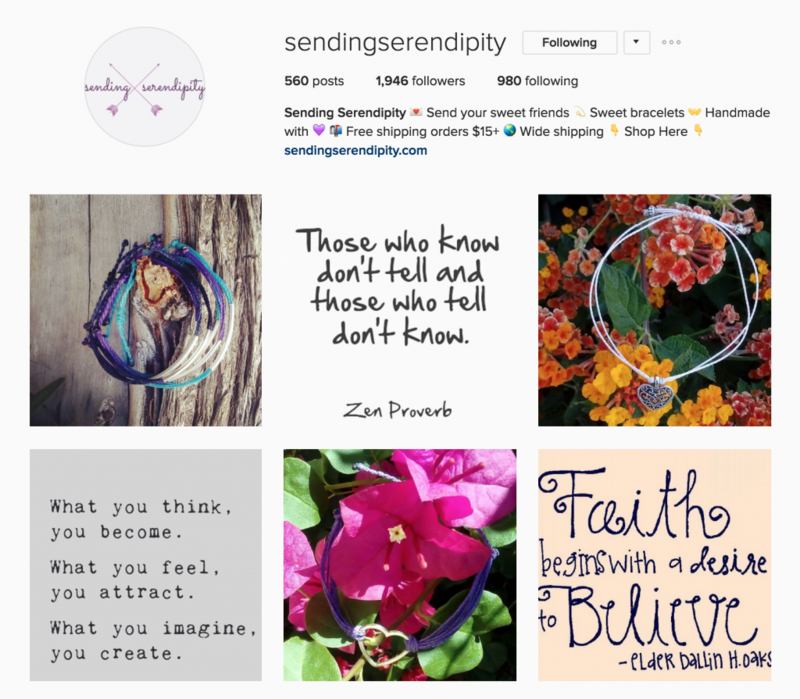 In addition to Instagram, Sending Serendipity is also active on Facebook, Twitter, and Pinterest. They share daily updates across the various social networks to keep their fans and followers engaged. Many merchants get stuck wondering what to post, and when. Sending Serendipity strikes an excellent balance between product images, customer photos, and inspirational quotes. Check out any of their accounts and you’ll find posts that not only showcase the bracelets but also offer inspiration and encouragement. Just like a little surprise in the mail, Sending Serendipity’s social media posts aim to lift viewers spirits. All that effort is paying off. According to Traci, their presence on social media helps drive a lot of their sales. The majority of their orders come from Twitter, Instagram, and Facebook. Speaking of email, it is also an important part of their marketing strategy. 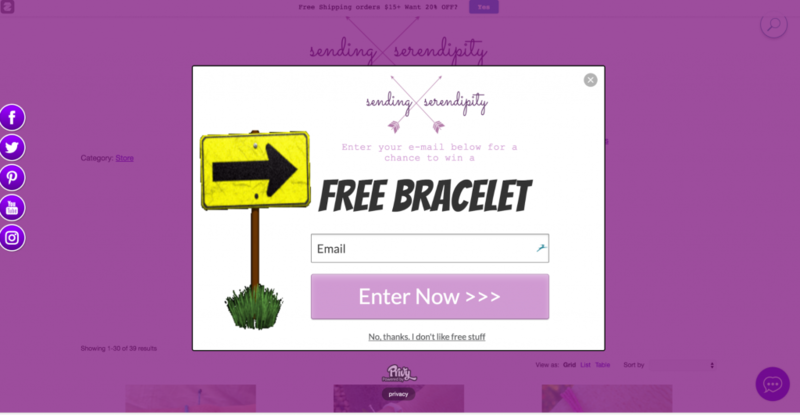 Sending Serendipity has increased their list by using a pop-up on their site inviting users to enter their email address for a chance to win a free bracelet. Sending Serendipity’s email strategy is powered, in part, by Privy, the app that displays the pop-ups. Privy syncs with MailChimp (Traci’s email marketing platform) so she can easily communicate with subscribers. Figuring out email cadence can also be tricky, and varies for each business. Traci says they try to send out a newsletter about twice a month to tell subscribers about their latest products and promotions; this, in turn, helps drive traffic back to their site. Finally, Traci makes the most out of online reviews. Customer reviews help build trust with new shoppers, which is especially important for online retailers without a physical store. Once the reviews are live, Traci shares them on social media to spread the word. According to Traci, that most significant step that they took in the business was starting it. I think the most important part of this journey was starting and then learning along the way.There were things that we wouldn’t have learned until we had sales, and all the planning in the world wouldn’t have prepared us for the things we encountered when we were actually in the trenches, she said. She also said that while there’s value in trying to figure out things on your own, entrepreneurs shouldn’t be afraid to ask questions or seek guidance from other people (e.g. your vendors). Case in point: Traci said that they initially spent way too much on shipping. At first we were just using the self-service kiosk in USPS and shipped the products on our own. One day though, the kiosk was down so we had to talk to the person manning the counter. That’s when we found out that we were paying about 50% more for shipping than we needed to — which was a lot! She added that if they had taken the time to talk to USPS in the beginning, they would’ve avoided overpaying for shipping in the critical early days before they had become profitable. Sending Serendipity’s story shows us that you don’t need to have all the answers to build a thriving business. In fact, you don’t even need a domain or fancy coding and design skills to create a beautiful, well-functioning online store. There are plenty of tools — such as Ecwid’s Starter Site — that can take care of all the techie stuff for you. So, what do you need? Answer: a product to sell, a bit of creativity, and the drive to make things happen. Ready to start your online presence with Ecwid? Create your Starter Site for free now. No transaction fees, a full-featured online store, and a forever free plan.